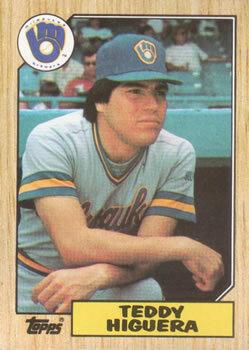 The last pitcher to win 20 games in a season for the Milwaukee Brewers was left-hander Teddy Higuera back in 1986. His 20th and final win came on September 25th that year. Only two other pitchers have won 20 or more games in a season for the Brew Crew, and both came prior to Higuera’s fantastic year. Mike Caldwell won 22 games in 1978 and Jim Colborn won 20 in 1973. Teddy Higuera was born Tedoro Higuera Valenzuela in Los Mochis, Sinola, Mexico, on November 9, 1958. He was in his mid-20’s when the Brewers purchased his contract from the Mexican League’s Indios de Ciudad Juarez. He spent one season in the minor leagues and made the big league rotation out of spring training in 1985. His biggest competitor was Yukata Enatsu from Japan, but the knock on him was age – as Enatsu was 36 years old. Higuera had a great first year with a 15-8 record and 3.90 ERA, which led him to the Sporting News Rookie of the Year Award. He came in second as AL Rookie of the Year. But 1986 was Higuera’s career year. Along the way to 20 wins he was selected for the All-Star game where he pitched against his hero Fernando Valenzuela. He finished second on the Cy Young Award ballot that season. 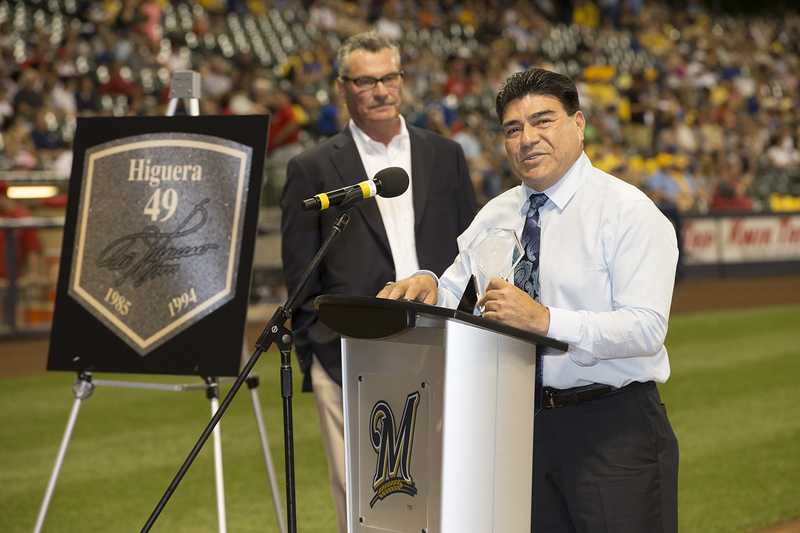 He and Valenzuela were heroes in their home country – a Mexican radio network carried all the Brewer games that Higuera pitched. After allowing just five hits in a 5-0 victory over Toronto on September 14, Higuera was just one win away from the 20 game mark. Higuera’s 20th win came fittingly in George Bamberger’s final game as Brewers manager. Bamberger announced he was beginning his retirement immediately after the game even though a few games remained in the season. The Crew won 9-3 over the Baltimore Orioles. Robin Yount came into the game for the injured Glenn Braggs in the fifth inning and helped out with his bat. Yount doubled in the fifth and seventh innings, and followed that up with a two-run homer in the eighth. The Orioles manager, Earl Weaver, also was retiring at the end of the season. 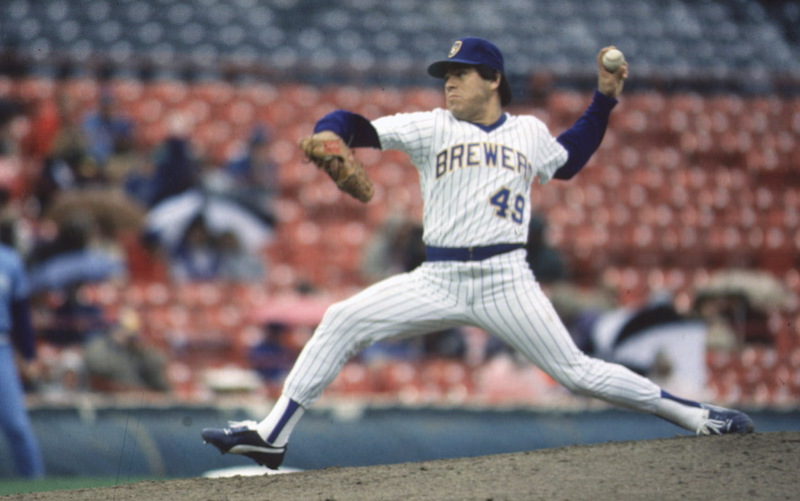 Brewers were not a good team in 1986, and the victory in Higuera’s final start helped the team get out of the basement in the American League East. Higuera did start one final game that season and could have tacked on one more win to his total, but lost 2-1 to the Detroit Tigers. Valenzuela was 21-11 with 242 strikeouts, 20 complete games, and a 3.14 earned run average. Higuera was 20-11, struck out 207, had 15 complete games with four shutouts, and a 2.79 ERA. Just seven of Higuera’s wins required a save from the bullpen. Five were saved by Mark Clear and the other two by Dan Plesac. By spring training in 1987 Higuera was learning how to speak English. On the mound he fell short of the previous season’s win total with 18 overall. He had 240 strikeouts and 32 consecutive scoreless innings on the year to set team records. Higuera lowered his ERA to 2.45 for the 1988 season, but had a 16-9 record over 31 starts. After that he was plagued by a number of injuries and never was quite the same pitcher. The ailments ranged from back issues that led to surgery and sprained ankles. He had a mostly healthy 1990 but finished with an 11-10 record and just 129 strikeouts. The front office felt he could pitch at the levels from earlier in his career and signed him to a four year, $13.1 million contract. The injuries were far from over, however, as Higuera tore his rotator cuff in 1991. He went through a number of surgeries and extensive rehab, missing all of 1992. He didn’t pitch a lot in 1993, with just 30 innings covering 8 starts. In 1994 he managed 58.2 innings both starting and relieving. By that time his ERA ballooned to 8.44 and the Brewers cut ties after the season. Higuera tried to catch on with the San Diego Padres in 1995 but did not make the team. He retired soon after and went into coaching. He has been the pitching coach for Mexico in the World Baseball Classic three times thus far. The Mexican Professional Baseball Hall of Fame inducted him in 2011. For his career, Higuera posted a 94-64 record with a 3.61 earned run average and 1,081 strikeouts over 1380 innings. Since he pitched more than 1000 innings for the Brewers, he met the criteria for induction into the Wall of Honor found on the exterior of Miller Park. He was one of the original 58 inductees in 2014. The Brewers also honored him in 2015 by election to the Miller Park Walk of Fame. He now has a granite plaque in the terrace area walkway outside Miller Park. 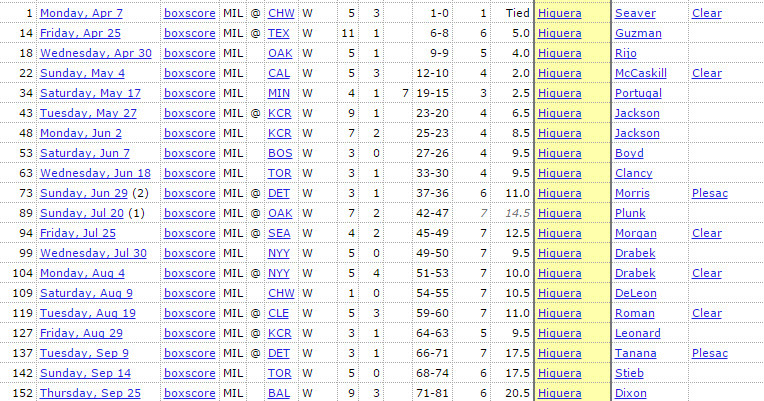 In the years since Higuera’s 20 win season, Chris Capuano came next closest to achieving the mark. His 18 wins in 2005 were the most in a season since Higuera won 18 in 1987. Wily Peralta went 17-11 in 2014. For now, Brewers fans will have to wait to see if another pitcher can post a 20 win season like Teddy Higuera did back in 1986. Here’s a short video of Higuera sealing his 20th win of 1986. And check out my Facebook author page for articles like this and much more!